Severe asthma and glucocorticoid resistance. Molecular mechanisms underpinning the biogenesis and the inflammatory responses of phagocytes and esoinophil. Roles of small ‘non-coding’ RNA molecules in the differentiation of innate immune cells and in the pathogenesis of respiratory diseases. Novel therapeutic approaches involving gene modulation. I worked in human immunology for many years. During this period, I saw many children who suffered from different kinds of terrible infectious diseases. Being supported by international postgraduate research scholarships, I completed my PhD in 2003 and was awarded the prestigious Frank Fenner Medal. This was the beginning of my medical research career. Through these years, I am happy to see the therapeutic potentials of my novel findings in curing those difficult-to-control diseases. A major focus of my future research is to investigate the role of host innate immunity in allergic and infectious diseases, and to develop better approaches to control these diseases. It is always amazing to deepen the understanding of our biological self. Dr Ming Yang graduated with a PhD from the John Curtin School of Medical Research, Institute of Advanced Studies, Australian National University, with the distinction of being awarded the prestigious Frank Fenner Medal for the most outstanding dissertation. Subsequently he was awarded a prestigious University of Newcastle Postdoctoral Research Fellowship with the goal to investigate the molecular pathogenesis of asthma. Dr Yang is now a key researcher in both the Priority Research Centre for Asthma and Respiratory Disease and the VIVA program. His research focuses on the role of the innate immune system in the pathogenesis of steroid-resistant inflammation in asthma. His research addresses an unmet need globally and is a NHMRC priority research area. Notably, Dr Yang has pioneered this research program and established experimental models of allergic airway diseases, acute respiratory infection and severe and steroid-resistant asthma, which better reflect the origins and pathophysiology of human disease. The establishment of these models has placed his research program in a strong position and has enabled him to publish manuscripts in high-impact journals. Dr Yang has published more than 37 manuscripts in peer-reviewed international journals with more than 2000 combined citations (based on Web of Science). These manuscripts were published in leading allergy/respiratory journals demonstrating that his work is consistently of international standard and highly regarded. He also published 16 conference presentations. These papers also demonstrate his value as a collaborator. 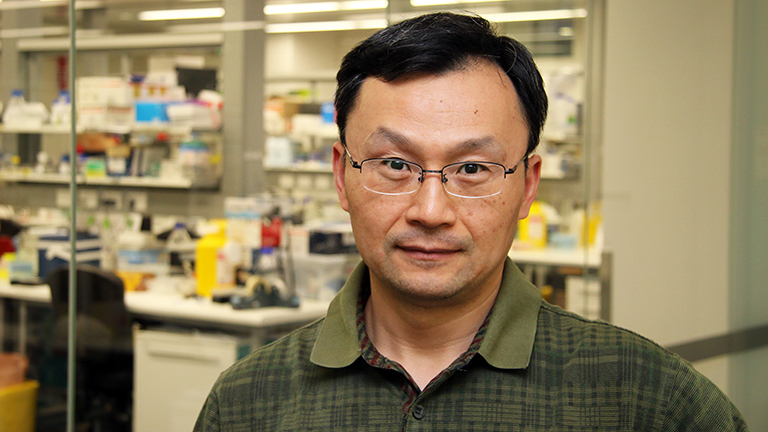 Dr Yang has been successful in obtaining competitive research grants (over $4.5 million). He has received funds from Ramaciotti Foundation, The University of Newcastle, HMRI project grant and NHMRC project grant as a sole investigator. He has also received research funds from CRC for Asthma, NHMRC Equipment Funds and project grants and Cancer Council NSW as a co-chief-investigator. He has been invited to present his work at international and national conferences. Dr. Yang is also actively involved in the supervision and mentoring of laboratory staff, PhD and honours students, and visiting academics. He is currently the primary supervisor of two PhD candidates. He is increasingly being involved in undergraduate teaching and research development of PhD candidates. The next big step is to determine the cellular and molecular events that lead to the onset of glucocorticoid resistance. Glucocorticoids have been used widely to treat many inflammatory diseases, especially those of the airways, skin and joints. However, under some conditions inflammation is poorly controlled by glucocorticoids, and the mechanisms are largely unknown. We aim to identify the novel genes involved in inflammation and steroid resistance, and to determine their potential as novel therapeutic targets. The overall goal of my research career is to contribute to our understanding of allergic lung disease development, progression, and response to therapy, with the ultimate goal of developing new diagnostics and therapies that improve the life quality of asthmatic patients.